These dedications below were originally posted on my website when Mike Evans died in 2010. Because I am preparing to close that web site (ianwhiteman.com) I am transferring the dedications and photos to this blog for posterity. They are worth re-reading in memory of a wonderful friend and brother who ventured to North Africa in the early 1970s to meet some of the great men of gnostic knowledge who were alive at the time. Mike Hajj Amin ‘Ace’ Evans, erstwhile member of The Action, Mighty Baby and The Habibiyya died on Friday evening January 15 2010 in London from a heart attack and was buried on 22nd January in Beaconsfield, near London. 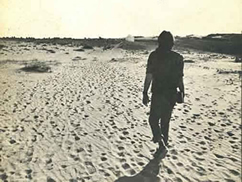 I’m staring at Amin’s picture on the cover of ‘The Sufic Path’ walking away on the beach towards a lovely white tomb. Allah shower him with sweet smelling flowers and comfort him in colorful carpets and brocade. And bring us all together again in the brightness of His mercy and forgiveness, singing the praises of His beloved with the most beautiful music. Hajj Amin was a pretty remarkable guy in his own way. One of the first houses we lived in was in Sparham, Norfolk with Hajj Amin. He used to get up before fajr and he burned oud. His presence was marked out and very strong. My memories are of that, and just as I write this I remembered something. Remember the booklet ‘The Sufi Path’ that came out long ago? It was one of the threads that brought me to Islam. Somehow I got a copy of it and for a long time I looked at the picture of Hajj Amin in it, and was so impressed by this man, who I thought was the Shaykh. He had that presence, may Allah reward him with the highest garden, insha’Allah. One reason his passing affects many of us so deeply is that he mirrored the forty year journey some of us shared with him from early music days in the Action and Mighty Baby in the late 1960s all the way through to adventures in Morocco, and later everyone’s flight from the nightmare collapse of the Norfolk sufi community in the late 1970s and all of our efforts to find some sanity. So it’s as if a bit of us has died with him. Hajj Mike Amin was a rare kind of being and a bit fragile like a Ming vase and when I first met him was quite introverted. I was the complete opposite and we had to try and learn from each other, and we did – through the music and later on the many journeys we made together including the Hajj. The people who knew him in the 1960s didn’t realise quite where he went later in his life and few people in the later period knew where he had come from. He had a truly amazing life journey and his music was a big part of it and intimately bound up in his spiritual world. Since his death I’ve been listening a lot to the music that he was part of and what strikes you is that his playing is not egocentric but beautifully and empathetically blended with the surrounding instruments. His playing was ineffably hip and original. As everyone who knew him will testify, he was always a silent powerful presence but when playing his bass, he was the underpinning powerhouse of the Action and Mighty Baby. In the Habibiyya he found a new voice on his bass mandola. I’ll miss him, as even now I think I barely knew who he really was and now it’s too late to find out. In late December 2009, I had an hour long phone call with him having not spoken with him for ten years. It was positive, cheerful and with no mention of his health. May his name be recorded in the highest heavens and may he reside in eternal bliss in the shade of the company of angelic beings and all of God’s prophets and saints. It’s no secret the Action are my favourite band, the one that mean more to me than any other. A giant framed photograph of them hangs over my bed and is my most treasured possession. There was something magical about discovering the band through the Ultimate Action compilation in the early 80s. Paul Weller wrote the sleevenotes – which was the royal seal of approval for a new mod generation – beyond that, I and other instant devotees knew very little beyond the handful of photographs on the inner sleeve. They looked immaculate and sounded magnificent. American soul covers by British pop groups usually ends in disaster, but with producer George Martin they took the essence of the originals and rearranged them with a crisp freshness their contemporaries couldn’t manage. Just play “I’ll Keep On Holding On”, “In My Lonely Room” or the sublime “Since I Lost My Baby”. For the past twenty-five years I’ve not gone more than a few weeks without listening in awe to their records. Their relative obscurity back then added to the mysterious air that surrounded them. Stories circulated that singer Reggie King had died falling down some stairs. He hadn’t. As the years went by, their story gradually unfolded. Each new photograph or the uncovering of a mention in a faded copy of Record Mirror would be akin to finding the golden ticket. In time, we’d even get to see a few minutes of film (although their Ready, Steady, Go appearance is seemingly lost forever) and hear some unreleased material. Even today there are few things I’ll get more excited about than a new snippet of Action related memorabilia. By the 90s I’d started my fanzine and simply had to name it after an Action track. With Shadows and Reflections already taken, Something Has Hit Me was born. I started by interviewing guitarist Pete Watson who’d not seen any of the band since 1967. A few years later I interviewed Reggie for Shindig! and he’d not seen anyone either, and later I’d interview Mick Evans (unpublished). When called by a promoter looking to reform the band I wasn’t keen. I didn’t want their sacred status tarnished by embarrassing old-bloke performances. Those gigs started in 1998 and ended in 2004. I saw all the London shows and we partied together in Spain. They weren’t brilliant but there was something special about seeing all five original members back together, playing and enjoying themselves. It stopped me being too precious about these things and saw what was more important. Talking to them they realised how lucky they were to be doing it and renewing old friendships. It wasn’t for financial reward; it was for the love of it. That love went from band to audience and audience to band. Michael was the one that with little fuss held it together. In my eyes, they kept their reputation intact. 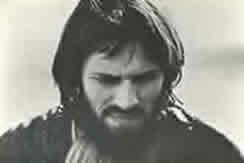 Evans’s playing and performing throughout his career was never showy or flash but he’d anchor bands with his fluid groove and leave space for others to take the limelight, especially when the Action morphed into psych-folk luminaries Mighty Baby and their incredible musicianship came to the fore. It was, Mike told me, the Mighty Baby period that he looked back on most fondly. I only knew Mike on a vague personal level but he struck me as quiet soul and had an aura of soothing calmness around him. The joy those Action records bring are today tinged with sadness. My heartfelt condolences go to all his family and friends. the bull’s eye of bliss. who I would have like to have known better. May Allah bless him, accept him into the Garden that he sang about so long ago. May Allah unite us in ornamented couches in the presence of Prophets, Saints, Shahids and Saliheen. As a child in Bristol Gardens, London. I thought of Hajj Amin as a gentle giant. His manner was very soft and he was quick with a smile and an invitation. I learned from Hajj Amin how to make a salad dressing using mustard and how to make Birds Eye Custard. Over the years, I would visit him in London at his place of work and have conversation about everything. And even with all the nonesense regarding the Fuqara, he never had bad word about anyone. I wish I could remember his jokes but I do remember his soft laugh. I will miss him and I ask Allah to make his grave wide and cool. And best wishes to his family. …that the pen might be thought of as our bodies, the ink our blood, or the “blood” of our spirit that circulates through them, our lives the “writing” bodies of our beings that both write out our actions as we act them, and leave traces behind when we leave them. The death of someone we have known, intimately or not, is always sobering, as it is not just another human somewhere who’s died, but someone with whom we shared a dimension of life, affecting our own by our simultaneous existence in that living space. And the final impressions, how we leave our traces, every conversation, gesture, attitude, transaction, are crucial markers of us when we must go on to the next existence in the final world, imprinted in the memories of those still living who knew us, and sent ahead for the final “reading,” carrying our “books” with us. Hajj Amin, for me, left nothing but positive traces all the time that I knew him back in the 1970s, when we were all fledgling Muslim Sufis, practicing with earnestness a spiritual path none of us were born to, undergoing sometimes wrenching transformations with, in our case, an acidic teacher who was the deputized representative of a true Friend of God, Shaykh Muhammad ibn al-Habib of Fez. 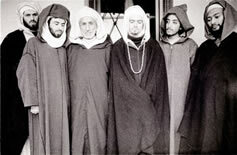 While the methods of our teacher may have been sulfuric, the light of the shaykh in Morocco, whom we met and with whom we sat, and with whose oldest disciples we lived for a time, that light of Allah he radiated, absorbed according to our varying capacities, not only at the time but until the moment of each of our own deaths, is not an inconsiderable one, easily ignored, but a true witness of our own small presence in purity and yearning with the Truth Himself. Hajj Amin Evans was there, he suffered the sufferings and tasted some of the joys, and now he has gone ahead. For him, the famous cage bars of this world have melted. And I only remember a sweetness, an earnestness, a taciturn personality that spoke rarely but pointedly, and often with a wry (North Londonish) amusement. He witnessed, and is now himself a witness. A shahidin his illness, struck down by the heart, his core of gnosis. Irradiated along with all of us by the light of the Master and the Path, he can testify to that original reverberation of his heart, and by it recognize in the next world the Generous Face of Allah. May Allah take him to Him, in superlative radiance, in forgiveness and purity, and grant him an eternity of sweetness and beauty. 1972 — I find myself hurtling across the Mojave desert in my little convertible Sunbeam, with three British Sufi Dervishes — Hajj Amin Evans, Abdur-Rahman Wolff, and Abdal Adheem Sanders! I am being driven and accompanied across the United States, from Berkeley, California, ostensibly to visit my ailing mother in Philadelphia, and they are getting an inexpensive way to New York where they are booked for a Tramp Steamer voyage to Morocco. How I met these three extraordinary and lovely men is another story in itself, but suffice it to say that I have rarely in my life felt so protected and surrounded with such sweet baraka! In the car the talk was of Allah and His Prophet, the singing was the Diwan of Shaykh Muhammad ibn al-Habib, raheemullah, the dhikr was hypnotic for me — I had never heard anything like it before! And most of all, every few hours we would stop along the side of the road or wherever we happened to be, and these three angelic guys (that’s how they seemed to me) would do the Prayer. But somehow most of all I remember Hajj Amin as the one doing most of the talking — and everything he said was a healing for my almost broken, burnt-out Berkeley hippy heart. What a refuge of Truth, Solace and Perfection he described for me. What a web was woven by his amazing words — a mandala of all that I had been searching for, all the pieces came together perfectly — I was becoming a Muslim and there was no turning back! So thank you, Hajj Mike Amin — Mash’Allah, I think maybe you were the one who “reverted” me — and to this day I still thank Allah for the gift of Islam! May your present voyage be sweet, peaceful and full of blessings. I first was introduced by my brother to the music of The Action while I was at University in the early 1980s and ever since I have been utterly captivated by the superb body of work produced by that hugely influential group and its subsequent formations, Mighty Baby and The Habibiyya. Hajj Amin Mike Evans was an enormously talented bass guitarist who, I think, also played as a session musician on numerous songs by other artists during the late 1960s and early 1970s. The infectiously propulsive sound of The Action – an act much favoured by the original Mod youth cult – emanates primarily from the band’s rhythm section – Mike Evans and drummer, Roger Powell. Mike Evans’s bass guitar provides the songs with their centre, their pulse, their heartbeat, one might say. It’s the bass that gets you, deep down in your bones and swirls you a place of ‘Shadows and Reflections’ into the ‘Land of a Thousand Dances’. It’s something that is more than physical. It’s the bass that allows you to ‘…Keep on Holding On’. No wonder the group has been dubbed, ‘The Best White Soul Band of All Time’. Later, of course, the stratospheric explorations of Mighty Baby, arguably one of the best bands in British psychedelic-jazz-power rock and the intimate, hypnotic and quite unique spirituality of the Habibiyya portrayed a man keen to explore new instruments, different modes, an artist who clearly was not content to churn out a formula and whose life and music were densely intertwined. This is an example which many of today’s musicians – and audiences/ listeners – especially in the pop-rock sphere, would do well to study. This music has been permeating my consciousness, my heart and my breath for nearly 30 years now. It was, and is, one of the drivers of my own work. I am immensely grateful. When, around a year ago, for the first time I contacted Hajj Amin Mike Evans regarding something I was writing, he was effusive, warm and helpful. I am deeply saddened to hear of his passing. I wish to express my condolences to his family and friends. Hajj Mike Amin was a kind man. He was a good man, a serious man, a man with a heart of gold. He was deep; a stillness on the surface hid whatever turmoil lay underneath. I count him as one of my true, real friends. We travelled many roads together, and through our shared experiences formed an unbreakable bond that was not diminished by separation in time or distance. Each time we spoke it was as if we had just parted the day before. The last time we were in touch we spoke like brothers and made plans to meet again soon. Sadly now that is not to be. May he rest in peace, free now from all suffering. May the blessings of our prayers reach up and help ease the way for him. I first discovered the beautiful music of The Action in my early teens almost 30 years ago and followed their amazing musical and spiritual journey to Mighty Baby and The Habibiyya. In addition I discovered Mike Hajj Amin and his bandmates synergistic session playing all over many of my favourite albums by other other artists of the era-which in retrospect is what imbued the music on these records which such a truly special quality which cannot be quantified, commodified or replicated. The words soulful and spiritual spring to mind but these are truly inadequate descriptions. Hardly a week has passed over those 30 years Im sure where I have not heard Mike’s basslines in my head. I see my older brother Suhayl has posted on this site and last year when he told me he had been in email contact with Mike Hajj Amin et al I was incredibly excited. We talk of The Action/Mighty Baby/Habibiyya so very often. Many many times I had intended to email too but just never knew what I would say that wouldn’t come across as gushy or embarrasing. I didnt know Mike Hajj Amin personally but his music and brave and incredible journey in but a few short years from West End Mod to Islamic spiritual seeker (whilst simultaneously maintaining, exploring and celebrating his musicianship) has provided so much meaning, inspiration and encouragement to me over the years that its difficult to express how sad I am to hear of his untimely passing. I would like to send my deepest condolences to his family and friends. From the bottom of my heart, thankyou “Ace” for creating such beautiful music. May it go on forever. I always remember the first time I met Hajj Amin ~ who always greeted me with a smile, I asked, “So do you believe in heaven and hell like the Christians?” and he smiled at me and replied, “It’s not like that.” As in love minus zero, he knew too much to argue or to judge. Hajj Amin was a true seeker who as a youth left everything, including a very promising career in a field that he loved, for the path of Allah. This is not a small thing in the eyes of Allah. May Allah reward him for this and the kindness and generosity that he showed to all he encountered throughout his life. Amongst all the beautiful prayers and tributes for Hajj Amin, I unexpectedly found closure at an evening of dhikr in north London the night after his funeral. At the end it was announced, “One of the original English murids of Shaykh Muhammad ibn al-Habib has passed away —Hajj Amin, raheemullah” and those assembled were asked to make dua’ for him. It was a very strong dua’ and during it I realized something profound of who Hajj Amin really was, through the exalted company that he was fortunate enough to have kept in this life and, insha’llah, will be keeping in the next. Amin. Though I hadn’t seen him for a few years, I felt a great wave of sadness on hearing of his passing. Spontaneous tears washed my face and hands, releasing a huge space to remember Mike Evans. Most mornings for 3 years prior to his retirement, I would stop for a coffee with him before I climbed the stairs to the job he got me on the second floor. Sometimes, we would spend up to an hour breezing through life’s oddities, we moaned about injustices that deserved it, carved solutions to impossible conundrums and often (and innocently) conjured coincidence. Of course, there was always something to be said about music. He once played me a single microphone recording of Mighty Baby at the first Glastonbury festival. Not only did it set me off in ‘new dimensions’, it sounded unbelievably rich as if it was in stereo. Mike had the ability to nudge life your way when you most needed it. I once spoke about a sister whom l loved dearly yet hadn’t seen for some years. As Mike was finishing the story of how The Action was reformed, my sister called me. She was standing 100 meters from the office wondering where in London she could find me. Mike was magic like that and this is how I remember him. His modesty gave indication of his huge talent and his peaceful manner gave way to an all seeing eye. He was a light house in a sea of truths. My sincere heart felt condolences go to his family and close friends at this time. I would also like to thank the owners of the website for providing me with a space to pay my respects to Mike Evans. And then, SAMA, our first tastes of bliss. ALLAH, please grant Hajj Ameen Eternal Peace. an inspiration to so many. May the Heavens now play theirs for him. In Memory of Hajj Amin: He had a beautiful heart. He was an extraordinarily kind man, occasionally in spite of himself. He could be acerbic and sometimes sour but there was always a deep sweetness beneath the surface, a sweetness that radiated from his beautiful face. I don’t believe he was ever entirely comfortable in this world. I believe that the circles of remembrance were his métier, his home. I was deeply fond of Hajj Amin and I will miss him very much. I ask Allah to make the Gardens of Delight his home in the next world in the way that He, may He be exalted, made the gardens of remembrance his home in this world. May Allah cover him with His Endless Forgiveness, Mercy and Grace. May Allah flood him with His Light, and Light Upon Light until the Day of Rising. Amin. Thankyou for your kindness in forwarding this sad new to us in Japan. I will read Ya Sin for Hajj Amin and make a du’a. He was our beloved brother and we pray that Allah will have mercy on him and forgive him and grant him a beautiful place in Paradise.